Having a siding contractor in Dearborn Michigan install new siding on your home can give you many benefits. It can increase your home’s value as well as making it more energy efficient. Plus, new siding can mean your home’s exterior is protected by a warranty for decades to come. There are many choices for siding on your home and one of the most popular is vinyl siding. Vinyl siding has been around for many years and continues to be one of the best siding choices. We’ve included some of the biggest advantages of vinyl siding here and what makes it such as great siding choice for your Dearborn Michigan home. Due to its great variability and longevity, among other reasons, vinyl siding has become one of the, if not the leading exterior home siding options picked for major home renovations and remodels. When compared to traditional exterior choices, vinyl siding just stands out among the rest due to its cost efficiency and great installation availability. Choosing to replace the siding on your home can be daunting and costly. With vinyl exterior siding, it doesn’t have to be. Vinyl is actually one of the most affordable options available in today’s market, and can help you to save money on such a big renovation project. No matter your budget, a vinyl option will be available to suit your needs, and many contractors or manufacturers will offer payment plans or financing options to get your home covered in the siding that is right for you. No matter the climate in your area, or the wide variety of elements your area may face, vinyl siding remains a great choice for anyone. Vinyl is sun damage resistant, wind resistant, rain and water resistant, and if even fireproof. Not only is your home protected from the harsh weather conditions when outfitted in vinyl siding, but you also reduce the risk of your home burning from the outside. With an insulated layer, your home interior is also protected from the harsh weather as there is a reduction in heat loss during the winter and reduced heat gain during the hot summer months. Vinyl home siding is the great choice for protecting your home all around. Vinyl exterior home siding makes for a long lasting and durable choice. Vinyl siding not only has a long life expectancy, but also often comes with a lifetime warranty, covering anything that may go wrong. If installed correctly by a team of professionals, you can rest assured that nothing should be expected to go wrong, but you would be covered in the rare event that it did. No matter your style preference, odds are that you can find something to suit your needs in vinyl exterior home siding. Classic to contemporary, just about any design option is available in vinyl siding, allowing you to boost your home aesthetics and increase your curb appeal. The only problem you will face when it comes to style or design is actually making the choice of what you want the most! With so many options available, you can completely customize the look of your home. It would be beneficial to speak with your contractor and team to best choose what is right for the style and architecture of your home, as well as what will work against the neighboring homes to really make your home stand out. Can you imagine a home with reduced maintenance requirements? We can’t either – well, for the most part. Vinyl exterior siding actually can help to reduce the amount of maintenance that is required due to the long lasting finishes available. The color and design features a permanent coat that will not fade or ruin over time. Vinyl requires very minimal maintenance, just to ensure no mold or mildew occurs, so a simple routine cleaning is all that is necessary. If you’re interested in getting a pricing estimate for installing vinyl siding on your Dearborn Michigan home be sure to call the experts at All Point Construction today at (734) 407-7110. All Point Construction is fully licensed and insured siding contractor in Michigan. 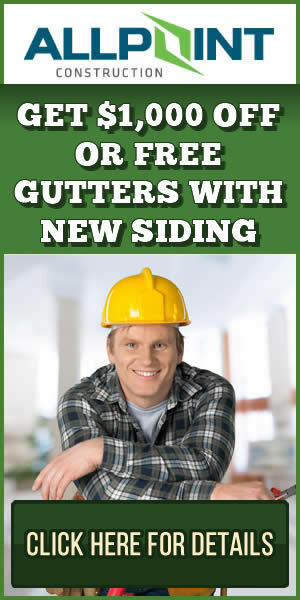 Call today for a free quote for installing new siding on your home.